Esselgroup - Mumbai FC wins yet another match! Mumbai FC wins yet another match! Evans Quao stepped up to the challenge and scored for Mumbai to put an end to its eleven match winless streak in the ONGC I-League. The away win over Viva Kerala is its first after beating Shillong Lajong at home in January. 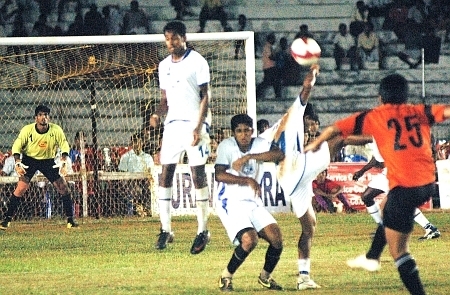 Viva Kerala's poor run of form continued in this Round 23 match played at the EMS Stadium, Calicut. Evans scored the winner for Mumbai in the 27th minute. Mumbai was good throughout this tough away fixture against Viva Kerala. Viva has kept big guns like Dempo, Mahindra and Churchill in check at their home ground this season. The home side only managed to create a few opportunities in the game. The match began with a golden opportunity for the home team to take the lead. Nidhinlal wobbled a shot from Viva Kerala winger T Karma and Anish KP tried to take advantage by heading it towards the Mumbai goal, only for Mumbai goalkeeper Nidhinlal to come up with a spectacular double save. In the 18th minute, Sirajuddeen was unmarked but Nidhinlal again did well to save the day for Mumbai. Mumbai's first major move came after twenty minutes when Subhash Chakraborty's cross from the right found Bashiru Mohammed Abass. But this time, it was Viva Kerala keeper Sharath K who got rid of the danger. The all important and only goal of the game came from Evans Quao in the 27th minute. Evans successfully got past the Viva's backline and fired in a quick shot to beat Sharath K.
Viva Kerala began the second half with a string of attacks, but were unable to create a worthy chance till 20 minutes into the half. Right back Noushad overlapped to send in a cross, only to be squandered in the box by an unmarked Karma. In the next minute, Reuben Senyo dodged past Anas Edathodika and tried a shot from long range but goalkeeper Nidhinlal did exceedingly well to fend it off. The second half also saw the return of Mumbai Captain and Indian International Abhishek Yadav from injury. He quickly got in to the thick of the action. Seven minutes post his arrival, the forward managed to dodge Noushad K and rushed freely towards the goal, but defender Charles Dzisah was alert to get the ball from him. Nidhinlal AC was rightly adjudged Man of the Match in the highly physical encounter at the EMS Stadium. Mumbai moves to 9th place with three crucial points from the match, and have garnered a total of 25 points from 23 matches. Viva are two places below the Mumbai outfit on a inferior goal difference.